Channelview High School recently held its Shattered Dreams program designed to prevent teen drinking and driving. The event was hosted by Ben Taub Hospital’s Trauma Services Department, a part of the Harris Health System. As part of the program, a simulated crash took place near the school on the first day of the two-day event. 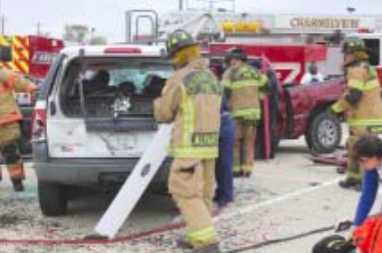 Channelview EMS and Fire, Harris County Constable Precinct 3 deputies, along with other local emergency personnel participated in the event as “first responders” to the staged accident scene, where students were portrayed as fatal accident victims. Students filed out into the parking lot of Channelview High School and saw one of the worst automobile accident scenes they had ever witnessed. It was only a simulation. It definitely got the students’ attention. It was all too real. Shattered Dreams is an educational program designed to prevent teen drinking and driving. The event was hosted by Ben Taub Hospital’s Trauma Services Department, a part of the Harris Health System. The event was coordinated on the CHS campus by teacher Karen Hebert. As part of the program, a simulated crash took place near the south side of the school on Crockett Street on the first day of the two-day event. Channelview EMS and Fire, Harris County Constable Precinct 3 deputies, along with other local emergency personnel participated in the event as “first responders” to the staged accident scene, where students were portrayed as fatal accident victims. The night following the event, some students were allowed to visit the trauma center of Ben Taub Hospital and see emergency medical procedures being conducted on accident victims and shooting victims. In addition to the accident victims, other students known as the “living dead” left their classrooms representing those who died in alcohol-related car crashes nationwide. A memorial service was for the victims was held during the second day of the program at the Bill Neal Center and several speakers will addressed the dangers of drinking and driving. As the letters were read, they clearly affected the students and faculty members as they could be seen sobbing in the audience.